It’s that brief time of year when shadflies (also known as mayflies) hatch en masse and flutter in swarms, searching for mates before the few days they live as adults are over. Like moths, they are attracted to light. That makes stadium lights at places like Clinton’s Ashford University Field a prime attraction, especially because the ballpark is located near the Mississippi River. At least the shadflies waited until after the game to swarm the field. 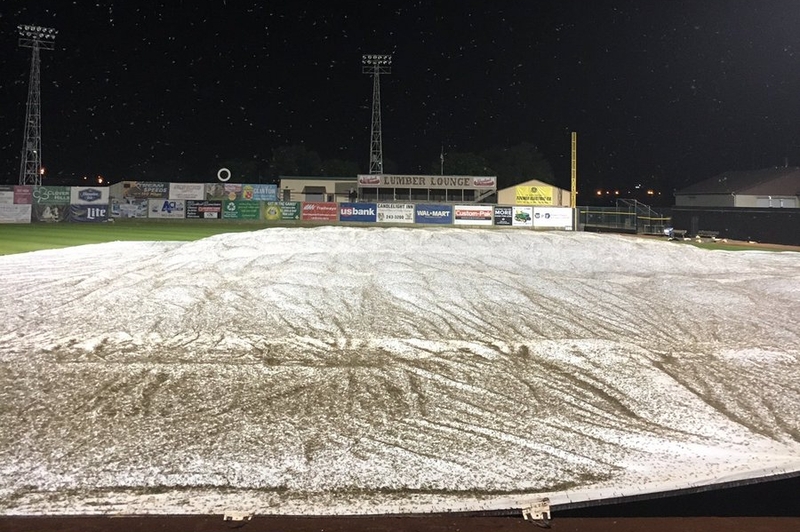 I’ve been to a few games at Quad Cities’ Modern Woodmen Park — another prime attraction for shadflies thanks to its location — when the insects swarmed above as play continued on the field. It’s an experience that’s hard to forget, particularly if shadfly carcasses start dropping around you while you’re trying to watch a game. This entry was posted in Clinton LumberKings, Midwest League, Quad Cities River Bandits. Bookmark the permalink. There’s a similar situation in Harrisburg. That ballpark is right on the water and the mayflies are thick at certain times of the season. I remember standing on the concourse and having them just drop everywhere like snow. As you say, it’s an experience that’s hard to forget. The Senators even introduced a third cap with a mayfly on it!